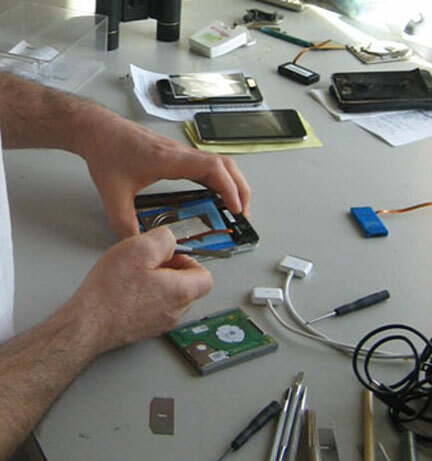 iSick Bay is a highly personalized (think "concierge") repair service that exists to help people get their iPhone, iPad or iPod running on a cost effective basis. The primary mission of iSick Bay is to help keep as many devices running as possible, on a cost effective basis so a device that merely needs surgery to extend its life finds itself in the hands of skilled and knowledgeable device surgeon. I am an ardent environmentalist and make every effort to repair your iPod before I get you involved in buying a replacement part. I want to make sure all potentially useful devices don't find themselves in a landfill or traded-in to Apple (so they can be trash compacted) sooner than they need to, and I don't want one extra device over-manufactured as a 'replacement' when an 'organ transplant' (LCD, drive, battery) will solve the problem for some time to come. I have people send me their iPods from as far away as Scotland, Korea, Greece, Sweden, Brazil, London/Britain, Canada and *all over* the US. I am basically a concierge iPhone, iPad and iPod doctor. I only take on between 4 and 8 "patients" a day and get them working perfectly. I have become expert in liquid immersion problems. If you've dropped it in water, milk, hot tub, washing machine, lake, ocean, swimming pool, bath tub or toilet and can get it to me right away, I can usually resurrect it. I can make it run perfectly *and* preserve all your music and video files. Because of my Computer Science training I can deal with iPods and computers in ways most people can't imagine. Frequently a client will have *lost* their iTunes Library. I can pull the songs from their iPod in and give them back to the client in a form that they can add them back to their new iTunes Library permanently and I deliver it with exact instructions on how to add them to the iTunes Library. Typically, your device is out of your hands a total of 4 to 6 days depending on where you live and if a Sunday has fallen in the schedule.